Subject: Re: So, how do I land side jobs? So, how do I land side jobs? I know this question may seem kinda silly to some, but how do I land side jobs? I've been doing cabinets for 25 years and have never done a lot of side jobs, just a few for some family members, but nothing more ever came of them. A few years ago I posted ads on Craigslist, even had a website but I got ZERO inquiries. Was it the economy? I even went to a printing business that delivered ads to about 10,000 houses and still got nothing. I had door hangers made up and spent a few weeks putting them on a coupla hundred houses and got no response either.Also, I'm located near the San Francisco Bay Area and I know there is tons of work being done around these parts. Does God have a personal vendetta against me? Yes, it appears that the Lord does have a personal vendetta against you. But seriously, what do you mean by "side job"? If you have your own business aren't side jobs just regular jobs? I work for someone else and by "side job" I mean a job I am doing for someone on my own. I have no intention of staying at the place I'm at now and would like to have my own business again. I have my contractor's license and had my own shop from 2007 to 2009. So you want to start up a business and wonder how to find customers. How about starting with a bit of research on the market and the competition in the geography you want to serve and put it in the form of a business plan? What about finances? Do you have enough cash available to fund a start up and not pay yourself much from the sales of a fledgling business for several months/years? You'll also need to define very carefully exactly the kind of customer you wish to sell to, how you will get your marketing message to them, what competitive advantages you can offer and a host of other items. It's called a business plan and there are plenty of books and resources on how to develop one. If you want to have the chance of starting and maintaining a successful, profitable business, you'll need a business plan. It's not an easy road and is certainly not for everyone. Very few start ups make it to their first year anniversary. Even fewer make it to their 5th anniversary or beyond. I'd suggest you pick up some "how to start a business" books, seek advice from organizations like SCORE and other trade groups and prepare yourself for a marathon run to get your new business launched. Its going to take a lot more than working for your family members, running a free ad on Craigslist, hiring a company to deliver ads for you or walking neighborhoods to do door hangers. It's also going to take lots more than 40 hours per week. You'll need to think in terms of not taking days off for a very long time, and make the commitment to working on your new business literally every day for almost all of your waking hours for the next several years. Your friends and family will not understand what you are doing and will likely not be of much encouragement unless they already own and operate a successful business. Or you can stumble and fumble around looking for a few side jobs, not do the business plan or not have funding set up to get you started and hope the stars are all in alignment where a new profitable business will magically appear in your lap. Bottom line: If it was easy to start up a new business and have it become successful and profitable, everyone would be doing it. Listen and learn from those who have done it and be prepared to replicate what they have done to give you a much greater chance of success. I think it is wrong for you to look for "side jobs". You should turn all leads over to your employer. I don't accept side jobs and don't appreciate when the other guys in my shop do them. They are taking food out of my mouth as much as our employers. Give your employer your best and as his business prospers, so will you and your fellow employees. God doesn't have a vendetta he is just trying to tell you something. The shop I work at does Commercial and I plan on doing Residential. I'm not going to speculate what God is saying or thinking, but vendettas are not His style. Not many woodworkers are good businessmen. You've gotten some solid advice about establishing a business plan and approaching this professionally. Obviously you've also now seen how not to market your business. Craigslist is a black hole, people looking for the cheapest bargain. Direct marketing such as door hangers has a horrible return on investment. Presuming you're going to concentrate on residential cabinetry, reach out to designers, decorators, and remodeling contractors. Write a letter (not an email) describing the type of cabinetry you build, the styles you work with, the finishes you will provide, and the services such as removal and installation you will provide. Follow up a week later with a phone call. Be prepared to take some small jobs at first as they feel you out for quality and dependability. That kind of targeted marketing is far more profitable. Document every project with before and after pictures. Establish a web presence as soon as possible and investigate search engine optimization, there are ways to elevate your web presence without spending any money. Go into multiple show rooms and present yourself as a problem solver for islands, book shelves and mantles they cannot order. OR, any other custom piece that cannot be ordered. You will be shocked how much you can make just making a few things here and there or cutting a cabinet down here and there. Humor us for a moment , if we were potential clients tell us why we should hire you ? Your answer may reveal helpful info that is relative to your quest . I understand your desire to earn as much as possible from a side job. I have always found them to be painfully hard without the setup of a full company. I get a lot of respect and good favor from my employer by bringing work into the company, and I make a little extra by doing the install myself. I have found work here on Woodweb, but mainly out in the community, by letting people know what you do. You haven't targeted you market. The shot gun approach rarely works. The question proposed "Why should I buy from you" should be given much consideration. Offer something not easily come by as per the suggestion of making the odd things the manufacturers don't. Are you equipped with a set of tools and room to work? I would say you would hire me because I have the best quality at the best price and can get the job done on time with no hiccups. Mauricio, I take it from your past marketing tries that you want to sell direct to homeowners. And you are saying that someone should hire you because you offer "the best quality at the best price and can get the job done on time". There needs to be much more to that statement to get the job from an end user's perspective. I'd be willing to bet everyone you will deal with has seen a big box ad, gone to a big box website or stopped by a big box store to look at what they have to offer. I attached one of the ads running in my market. 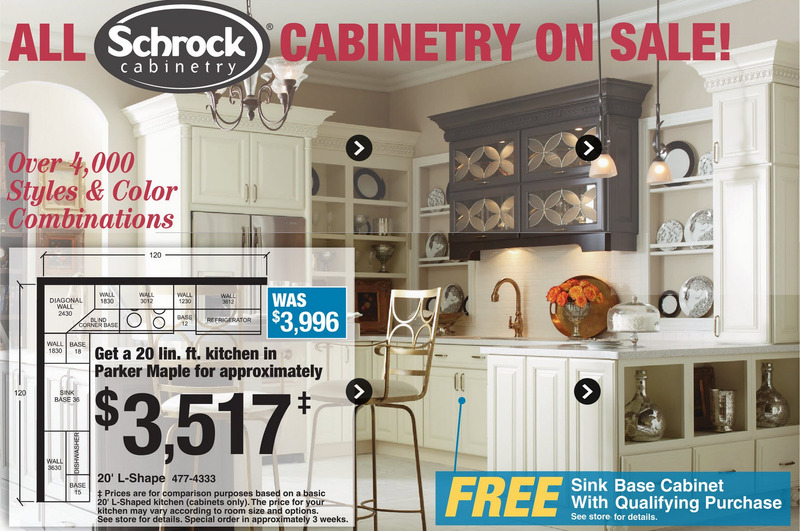 As you see, they are offering a Schrock 20 lineal foot "L" shaped kitchen for $3517, on sale from $3996. The fine print says they can deliver in about 3 weeks and that a free sink base is included with a qualifying order. As a consumer, your prospect may know that Schrock cabinets are a name brand with a reputation for good quality. If they don't they can find out more about Schrock cabinets by doing a Google search. I have 3 questions for you that your prospect will also have for you. 1. How much better quality can you offer than what Schrock offers? 2. How much cheaper can you build these cabinets for? 3. How much faster can you deliver them to me? Does that price include the countertop? what kind of countertop if it does? Is that available in Maple or Oak or Walnut or is it just white? Is it white paint or thermofoil? I'm not too concerned about competing with a big box store. People that go to them will go and people that want custom stuff will go with a place that does custom stuff. Forget the fact their supply is better discounted, but most offer some sort of financing. You could possibly have a good run at them with a fat capital pocket, maybe... #1 way to obtain "side jobs" , word of mouth. Social media plays a huge role IMHO. Btw, I also discourage this, as most times said employees don't deliver 100% performance when this happens. I think you are having bad luck, Having said that are you getting calls and pricing to high, or are you not even getting calls? The internet like others have said is the way to go, make a website showing what you are able to do, people like to see quality work. Another thing is talk to some of the residential shops in your area, see if there are small jobs that they may pass on to you.I know that the economy is a lot better so bigger shops may be more picky on work and may not have time or may not want to do these jobs. I totally disagree with what others have said about taking food out of your employers mouth. What you do on your time with your own equipment, tools and material is really none of their business. A prospective client notices your employee in his company shirt on an install and says, "Hey do you guys do entertainment centers?" The employee replies," Sure, but something small like that I could do it on the side for a lot less." The job was just stolen by an employee on company time. These small vanity and entertainment center jobs escalate to entire kitchens. Because this employee has no idea how to design a kitchen he tries to solicit your designer to help. The employee now has a deadline that he can't meet so he must take a sick day to complete the side project on time. I still think side jobs should not be allowed but this should be policy and clearly spelled out when the employee is hired so there is no confusion. Mauricio ,in general I would agree that those who know custom typically don't go to the big box for a nice job , maybe for the guest house or garage or an apt building? Those who are only looking at the bottom line will not be your target client base for sure. Comparing your products to a large factory is not apples to apples and should not be used as a pricing guide imo. Would you build a 4 or 5' sink base with stacks of drawers and no partition walls ? and out of 1/2" and 3/8" pb for the box ? be low , educate them and show them the difference in materials talk about the life expectancy of both .We don't design with voids and filler strips we make them to fit. Let your clients homes be your show rooms for new clients to see photos or in person if need be the big box can't do that. I do not totally disagree with you, you have some valid points, but in the end you do not own the employee, when an employee leaves your shop at 5 it is none of your business as to what they do. Good employees will make you a ton of money. Do you have profit sharing, or bonuses, for the employees? Can your employees work evenings or weekends if they want to earn extra money? Do you cater lunch for your employees every month and have a nice x-mas Party for them? Do you let your employees use your shop on a weekend if they want to make something for their own home? Employers and employees have a very unique relationship, treat your employees right and they will treat you right. If you are a big company you will always have a bad egg once in awhile who will steal from you or take a job from you like you were referring too. If someone wants to work extra hard to earn some extra money so he or she can get ahead, I say all the power to them. Side jobs are how a lot of small businesses are started. It is pure common sence to not take jobs from your employer. Guys that want to better themselves do side jobs and that is a good thing. Mauricio, don’t do it. If you have managed to work for someone else for 25 years, stick it out. Make some items you enjoy making and sell the items at a craft show. Running a business is for those of us than just can’t work for someone else. The longest I ever work for someone was 4 years. I had 3 failed businesses and said I was not going to try again when along came woodworking. I quit my job 10 years ago. Perhaps the failures taught me what not to do but working with wood has been very good to me. It is not something that I chose, woodworking chose me. You need business cards. Give a business card to anyone that asks you a woodworking question. Even if you are just helping them solve their problem. They know someone that needs your services. If they need to look for a way to contact you or the person that needs your services needs to work to find you, you lost the job. If you can get your name and number in someones cell, you just made a sale. Maybe not to that person but someone is going to call and say so and so gave them your name. A logo on a shirt goes a long way as well. Read the books on business and expect them to be wrong. The books tell you the way it should be, but life is never the way it should be. Some things will be right for your situation but many things will need to be altered. Everyone says “The Web, The Web”. For me, 99.9% of by business comes from word of mouth. So social gatherings are what work for me. It might look like I am out partying to my employees but I am networking. There are many events that I really do not want to go to but the time and money I spend socializing is my advertising budget. Plan to work very long hours for many years. Some think that as a business owner you can take off whenever you want. That is a myth. We keep it alive by leaving the shop to attend a chamber lunch or when we come across a slow period we take a long vacation. I spent two months traveling around Alaska three years ago, but have only had one day off in the last twelve months. (I had to work 18 hour days the week before and two weeks after to make that happen.) My business is only open 9-5 Monday thru Friday but that has very little to do with what hours I am working. 9-5 only helps my employees to guess what time I need them to work. One last thing, if you are going to offer quality and service at a cheap price you will fail. I would say you are unrealistic if you think you can find that as a consumer. Pick two and pick one to tell people about. Jobs will come up that something will need to give and you will have already made the decision what gives. When I started there were over ten shops in my area and now there are three. Quality is at my shop and cheap is the other shop I compete with. The third is a shop that has been around for 20 plus years and I have not had any dealings with the owner. If you decide to go out on your own, now would be a good time to do it. The customer are back and most of us that are still around are slow to hire. I think we are all trying to save for the next down turn or that bigger building. I have 9 employees. I don't mind at all if they do side jobs. I even let them use my shop. It's a perk for doing a good job working for me. They know there is a line they must not cross on taking work away from the shop. Most of their jobs are for friends or family or are furniture projects that we couldn't make money at if it were done in the shop.